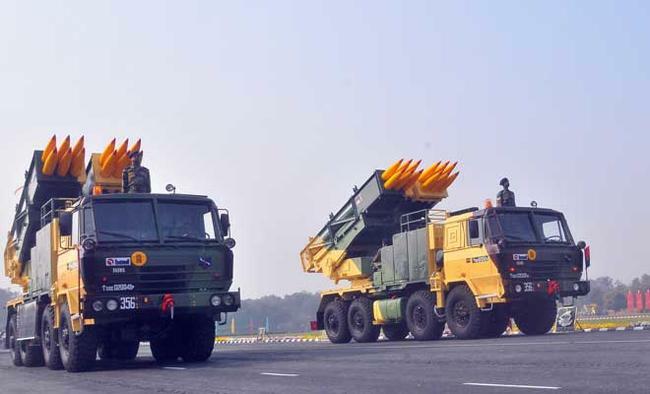 New Delhi: Tata Power's Strategic Engineering Division (Tata Power SED) on Monday said it received an order to supply launchers and command posts for the Indian Army's Pinaka rocket system.The order worth over Rs 200 crore is for 20 launchers and 8 command posts, said a company release. Tata Power SED CEO Rahul Chaudhry said: "Tata Power SED is proud to be part of successful development of one of the first 'Create in India' products. Being an Indian OEM (original equipment manufacturer) for this prestigious indigenous system gives us immense pleasure and we take this opportunity to express our sincere gratitude to DRDO for giving us the opportunity to be a partner in its development." "After the success of Pinaka, we remain committed to succeed in other Weapon System Development Programs with DRDO on which we are already working on," he added.This order will equip one regiment of the rocket system. The Multi-Barrel Rocket Launcher System PINAKA, designed and developed by Indian private industry in association with Armament Research and Development Establishment of Defence Research and Development Organisation (DRDO), is an area weapon system which supplements the existing artillery gun at ranges beyond 30 kms, and has a quick reaction time and high rate of fire. The Indian army currently operates two Pinaka regiments and is in the process of acquiring the third and fourth regiment. Defence Acquition Council of the Defence Ministry, on November 7, gave its nod to the proposal to acquire six additional Pinaka regiments.